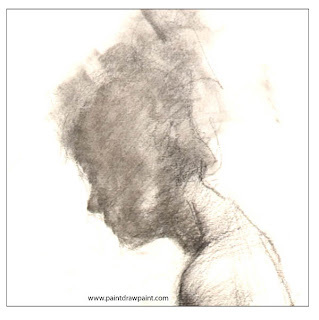 In an effort to help some of my students find new ways to illustrate the forms of the human figure, I have been working with them to try out new ways to describe the shapes they see. One way to do this is to avoid using the line to describe the outside edges of the forms. Line is an effective device to describe the boundaries and edges of forms and surfaces but it is not the only way. Today, I want to show how we can describe the figure without relying solely on line to both avoid outlining the figure in one even line and to suggest variety in the ways the figure is interacting with the space around it. Using the example above, I will show you a couple of different approaches to suggesting the edges of the head and neck. One thing to consider is an edge is not always suggesting the edge of a surface. 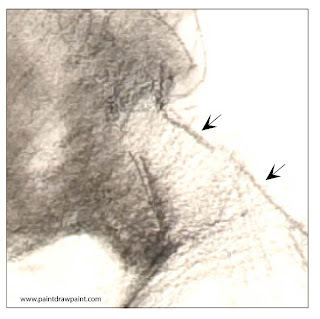 When drawing the figure, the surface doesn't just stop at that visible edge. The surface of the form wraps around the form and continues past the edge that we see. For example, the profile of the nose is only showing one side. 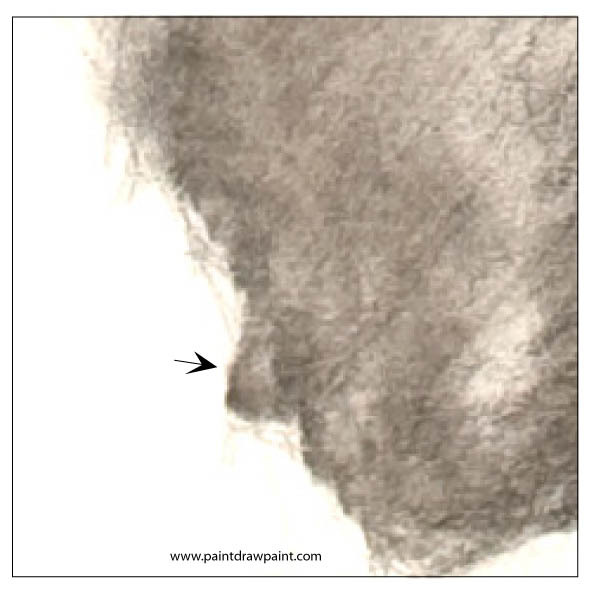 If I were to draw the tip of the nose in line I am then using the line to describe the point where the surface of the nose begins to disappear as it moves behind the surfaces that we can see. Instead of a line, I decided to show where the tip of the nose is at by using shading and value to illustrate the surfaces and mass of the nose. The shape of the nose appears in silhouette here and ends where the shading ends. There is no line indicating the tip of the nose. 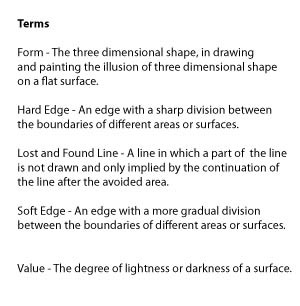 There is an advantage to using value or shading to describe the edges of shapes and forms. I can create different types of transitions between forms. For example, I can soften an edge to create a more gradual transition between forms or I can create a sharp edge with a quick transition from one shape to the next. Then, I can play with the use of the soft blurry edges against the hard sharp edges through out the composition to create the image I am looking for. The type of edges I decide to use and where I place them are designed to help describe depth, movement, and to establish a focal point. For example, when shading in the nose I can soften or blur the edges to create the sense that the nose is rounded and its surfaces are moving back in space, away from the viewer. The softer the edge the more rounded it will appear. So, I will blur the edges of the tip of the nose more than the bridge to suggest a more gradual transition of the surface of the tip of the nose. I don't have to give up on the line completely. For example, I can also vary the weight or thickness of my line. I can change the thickness of the line to change the character of the line. By making the line thicker in spots I can suggest weight or bring attention to a particular area of the composition. I can also make the line thinner to lower the contrast and draw the eye away from that area. We can also break up the line. That is to not draw the whole line as it moves down or across the form. Instead, I can just imply that there is a line. I do this by continuing to draw the line after the area I left blank in a way to suggest that it is one line. This is often called a lost and found line. The effect of this is similar to blurring the edges of a form. The part of the line that is drawn indicates the form and works like a hard edge. The implied or missing part of the line works much like a the soft edge of a form, suggesting that the form is rounding or out of focus. These are just a couple of techniques to try out in your figure drawing that may add new interest into your work. Test out the different approaches to see what you like.